If you have been a subscriber to the LiveWorks Newsletter for a while, than you are painfully aware of the fact that I’m far from an expert on technology. I hired a pro (thank you Alan) to look at the email delivery problems and believe that you will not be reading the “Political Marketing” letter again unless you want to (fingers, toes, and everything else crossed). Anyway, if technology makes your customer’s life easier you should be using it. My family has only lived in LA for a few years and we needed an eye doctor. If you need info in this town, call Irving. So I sent an email to Irene (Irving’s long time right hand) asking for a contact. A few hours later I had my appointment (thank you Irene and Irving). The person who scheduled my office visit was extremely professional. After going through all of the office procedures and directions, I was told to expect an email with two forms for me to print, sign and take with me to my appointment, and a link to the office’s new patient paperwork so all of that could be taken care of online prior to my arrival. Here is the email I received. Thank you very much for scheduling an appointment with our office. Please feel free to visit www.richlineye.com for Welcome Forms, Directions to the office, and Parking Instructions. The Welcome Forms can be submitted electronically through the website, directly to our office. In addition, please find attachments which must be printed and brought in with you to your appointment. If you have any difficulty with the Welcome Forms, or have any questions at all about the electronic forms, the printed forms, the website, or your appointment, please do not hesitate to contact myself, or the office at your convenience. Once again, thank you for scheduling your eye examination with Richlin Eye Associates. We look forward to seeing you in our office very soon! Think about the exchange above. The doctor’s office makes it easy for the patient by letting them fill-out forms when it is convenient for them. You don’t need to worry about forgetting your insurance card or how to spell the medications you are on, you can do it from home. At the same time, it saves the doctor’s office time, money on paper, ink and electricity, chance for errors reading patient’s writing…and makes them look really cool. Then yesterday the confirmation email below arrived. I have never received service like this before purchasing tickets to any event…even through an American Express Concierge. We are being shown-up by Beverly Hills eye doctors. Dr. Richlin & AssociatesSteven Richlin, O.D., Jackson Lau, O.D. IMPORTANT: Please click a link so we know you received this message. This is a courtesy reminder that you have an appointment in our office scheduled for the time and date indicated below. If you are unable to keep your appointment, please let us know as soon as possible. If there should be anything you need to contact us for, please don’t hesitate to call or email at your convenience. We are happy to be your eyecare providers. SPECIAL NOTE: Our Building is currently undergoing renovations. Please excuse the dust. Our garage and main entrance are still accessible, so you should have no delays in getting to us. NEW PATIENTS AND RETURNING PATIENTS WITH NEW INFORMATION: We have included a link below to our online patient information form. So we can see you promptly and provide faster service, please complete and submit the form prior to your appointment. If you are unable to complete the form in advance, please arrive a few minutes early for your appointment. Thank you. For information about our office, please Visit Our Website. Let’s step it up and use technology to better serve our fans. Driving down one of our wonderfully congested streets in LA, I was struck by the billboard pasted below. It reminded me that in the live business we never market the experience, just the show itself. If we changed this, we would sell more tickets. 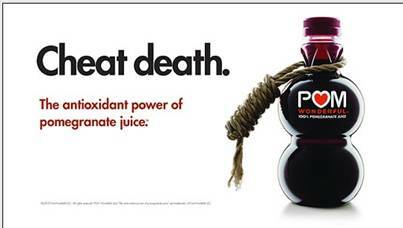 The above ad from Pom Wonderful does not tout the great taste of the beverage, its calorie count, unique color, or any of its other characteristics that could set it apart from its competitors. Instead, Pom grabs you with a headline, Cheat death… and a noose. Pretty easy message to understand. On your next tour, show, event, whatever, try marketing the experience rather than the show. If you are a concert promoter and have the band moe. coming through, try monitoring fan sites and chat rooms to see how they describe the act’s shows…and then market that. If you produce family entertainment or sports, push the bond parents can make with their children rather than the opportunity to see “so and so Live”. Over the years, I’ve written many times about my concert experiences growing up at the Saratoga Performing Arts Center in Saratoga Springs, NY. It would start with meeting up at a friend’s house. This way we could caravan up and park next to each other for tailgating. Driving I-87 North or South (depending on where you live in that part of upstate NY) you would see all the other cars, vans and pickups headed to the same place you were. Sometimes it would be as obvious as a carload of people and a sign in their window that said “ ____ or bust”. Other times it would be something simple like a beat-up Trans-Am (hey I did say upstate NY) driving next to you blaring the latest album from the artist you are going to see, on a stereo worth more than their whole car. Once at the show, walking around and people watching was the thing to do. That and marshmallow fights. At dusk, the opening act would usually hit the stage. Most of the audience were trickling into the venue by now, but not always paying attention to the band. Finally at 9:30 pm; house lights would dim, stage work lights would go out, and with much anticipation in the air the artist that everyone had come to see would light-up the crowd. You sang every word to every song and didn’t leave until the house music came up and the blinding light of reality signaled the march back to your car. Describe that when marketing your next live event. How is the show going to make your audience feel? What will the experience be like? Why should they pay money to go? It has been said a million times… “Sell the sizzle not the steak.” Most purchases are based on an emotional response. What could be better than hanging with your best friends, watching your favorite live attraction with people who are sharing in your excitement! Market that to fans and watch the tickets start selling.